THERE was joy for Cornwall in the County Championship on Saturday but disappointment for Devon. Reigning champions Cornwall booked a fourth successive trip to Twickenham by beating Surrey 32-14 at Camborne. The Duchy, who have never won back-to-back titles, ran in five tries, with three of them coming from Plymouth Albion fly-half Billy Searle. Cornwall, coached by Graham Dawe, will now play Cheshire in the County Championship next Sunday. Devon, though, missed out on joining them at Twickenham. The Green and Whites needed just a point from their trip to Kent to secure a place in the Division Two final at English rugby’s HQ and claim promotion back to the top flight. But, unfortunately, Devon, missing players from Barnstaple and influential back-rower Dan Williams, lost 29-8 to a strong Kent side, who scored four tries to top Division Two South by one single point. The damage to Devon was done in the first half when Kent scored three tries courtesy of a penalty try and touch downs by Charles Edwards and Aiden Moss, two of which were converted by Blackheath’s former Albion fly-half Freddie Gabbitass. Moss added a second try after the break, while Wayne Sprangle was in the sin-bin. Ivybridge’s Lewis Paterson was also sin-binned before Devon scored a try through Tom Goodman. Gabbitass finished the scoring with a penalty. Cornwall, with eight Albion players in their squad, were once again made to work hard for their win. Neilson Webber put them ahead early with a try in the scoreboard corner before Surrey fly-half Matt Noble levelled. Matt Shepherd, who played despite having a problem with his ear drum, kicked a penalty on 15 minutes before missing one four minutes later. Bristol-bound Searle scored the first of his tries on 22 minutes when he broke through from 35 metres and scored on the right to make it 13-5. 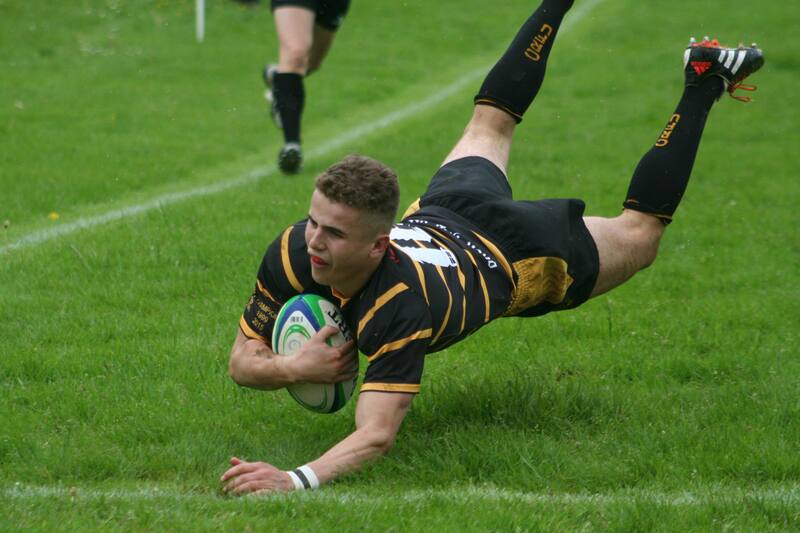 Minutes later he added a second in almost the same spot, which Shepherd converted to put Cornwall 20-5. They home team looked in control then, but Surrey then got on top. Noble kicked two penalties to close the gap to nine points before Shepherd hit the post with an effort at the other end. After the interval Noble kicked another penalty to reduce the gap to six points. The home crowd started getting restless as Surrey continued to press. But midway through the second half, Searle eased their worries with his third after a great break by Sam Matavesi. Shepherd converted to make it 27-14. And in the dying minutes replacement Lewis Webb went over in the right corner to seal the win.